We are excited to reveal the latest update in BQool Repricing Central! In this update, we revamped the interface to be more user-friendly and intuitive to use, as well as added several new features to maximize the software’s potential and help you win sales. 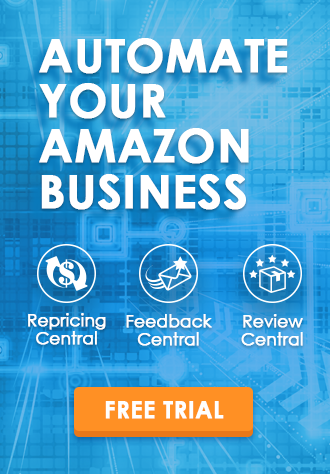 Repricing Central just received a makeover! The update gave the interface a contemporary look, complete with several additional columns to display more details about your inventory. Newly added columns include a repricing rule power button, inventory quantity, estimated fees, estimated profits, and estimated profit %. We have also merged product title, fulfillment type, number of offers, and ASIN all into the same column. To make the listings easier to read, the top row of the inventory listings will freeze as you scroll down the listings. All these changes make the interface more informative and intuitive to use. We worked hard in this update to make listings management a breeze for our users. To ease the process of sifting through your entire inventory when you’re trying to make changes, we have added a number of new filters as well as new Favorite Filter settings. With the new Group function, users will now be able to group or categorize listings to meet their specific needs. You may also use Bulk Actions to Add and Remove listings to/from Groups. Responding to our users’ outcry to eliminate the tedious work of manually entering inventory costs, we are excited to announce that Repricing Central now supports InventoryLab’s Closed Batch Report file. Simply upload the file, and our system will automatically populate the inventory costs to individual listings. 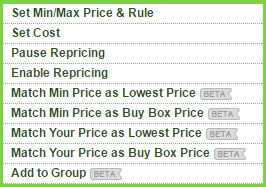 set prices to match lowest or Buy Box prices, to cut down on the manual work. 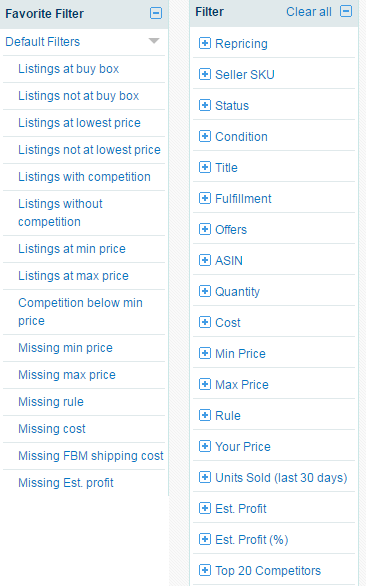 Users can now change min/max prices on individual listings and then bulk save all changes at once. One of Repricing Central’s most prized tool is the built-in calculator, which our users have found to be convenient and helpful with pricing management. In this update, we have further enhanced it to be even more powerful and accurate for estimating prices. The advanced price calculator is dynamic in that it enables you to estimate your price by either profit margin or amount, cost, or applicable fees. 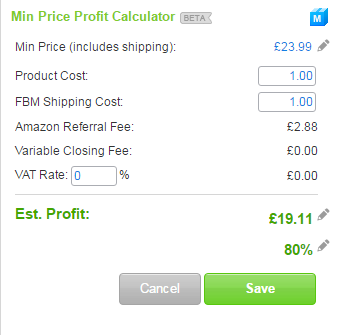 The calculator pulls various FBA fees to help you estimate your price for FBA items. For European marketplaces, the calculator can take into account VAT rates if needed. Repricing history is essential for sellers in fierce competitive landscape. For each listing, Repricing Central shows the repricing history for the past 24 hours, which allows users to get a clear picture of where they stand against their competition and adjust pricing strategies or change repricing rule accordingly. With the recent updates to Repricing Central, you now have a simple-to-use interface along with powerful features that will enable you to easily manage listings and optimize pricing strategies for a successful online business! We will be making more updates in the coming months, so keep checking back to see what else is new! For now, give our 14-day free trial a go today! If you are looking for further information, check out our support site! The updates are positive by and large but i very much miss being able to click into the min/max boxes and seeing in one place how much profit i should get from my current price. Now i have many more clicks to do to create/change a price or so it seems to me. Where I appreciate the availability of some of the new data, the new interface is not consistent and it is making setting min/max price take much longer than before. In the past i could click on one of the calculator icons and set both min and max price from one window. I could also set those prices based on percentage of ROI. Now I have to click on the min price calculator icon, try to figure out my price based on percent of profit and then I have to hit save and click the max calculator icon and do it all over again. In your bulk actions I do not have the option of setting my min/max by percatage of profit or percenatage of ROI. 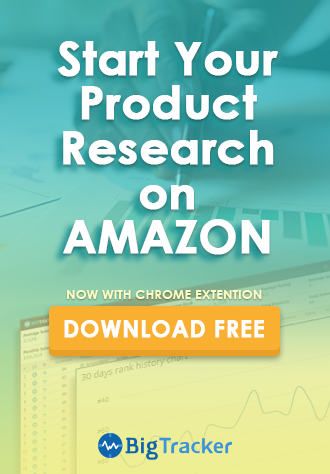 In fact, I questions whether or not the developers of this tool sell on Amazon or at least consulted with any sellers before making these changes. Please fix this, allow us to revert back to “classic view” or I will have to start shopping for repricer. Thank you for your feedback. As much as users have told us how they liked the simplicity and efficiency of the old calculator, the problem was that it only called the API one time. The fees didn’t update when you changed price and some users got really furious with the fees not changing saying it’s inaccurate and caused their prices to be set wrong and caused huge problems or lost money etc. the new price calculator updates fees with each value entered so it’s much more accurate. It’s been tough to balance these two issues. But we decided ultimately to move forward with the new calculator. Also, profit or % of ROI are actually the new features in our new Price Calculator. To continue improving your experiences with us, we will look for a better solution to reduce your time while setting up as well as keep the calculation accurate. Please feel free to email us if you have any suggestions! Why do get the ALERT “missing shipping fee” when I try to edit the min and max price now? The message “missing shipping fee” should only show up on Inactive listings. We started using a new and more accurate API a few months ago. On the new API, if the listings are Inactive then shipping might not be included. If you look at the “Your Price + Shipping” column you may see “-” instead of a shipping price. This means that the report has not yet provided us shipping. This was actually the case before except we used a different message instead of “missing shipping fee.” “Missing shipping fee” is just a more accurate description of the situation. If you wait for the listing to become Active then you should be able to use the Price Calculator. If you’d like us to reprice your inactive listing, you can still use other ways to set your prices to enable repricing. Hope this can help! If you need to add data to the upload template, please, oh please…make it optional and put it at the end (instead of inserting a new column between Max Price and Add-Delete.) My entire process is automated to create the upload file from Excel, and every time you change a template, I have to re-code my program. Second–even after making the changes, I am getting a “Shipping Fee is Null” error when I upload. My products are FBA–there is no shipping fee. How can I fix this? Hi Daniel we’re sorry to hear that our updated file has interrupted your workflow. We really appreciate you taking the time to let us know. In the future we’ll take this into account when making updates for our system as well as better communicating the details of our update so that you have time to make any necessary adjustments. We’ll respond to your other question via support. Thanks! How to Verify Demand for Sports & Outdoor Products?